← PINE RIDGE ONLINE TASTING, PART TWO. ZOWIE! 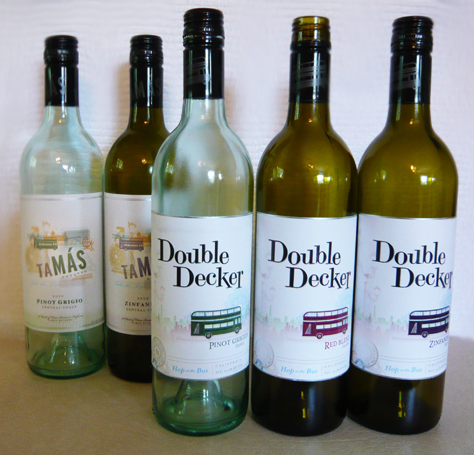 Monday’s tasting featured a flight of Double Decker wines. For the past 25 years or so, the Wente family has produced these wines under the Tamás Estates imprimatur, with its relatively quiet label sporting travel icons such as passport stamps, a double decker bus, and the slogan “Take the trip.” Apparently a doubting Tamás talked everyone into using the Double Decker name instead. Gotta admit, it’s a lot more catchy—the label itself stands out better, the classic London double-decker bus is more prominent on the label, the idea of taking a vacation is still there, and “Hop on the bus” is the slogan of the day. Okay, back to the wines. All of the Double Deckers are priced at $9.99. They will be available at Safeway, BevMo, and other stores starting in May. All are RECOMMENDED. Karl Wente talked a lot about acidity. With dozens of grapes to choose from, he blends based on taste and mouthfeel, of course, but also on what he wants the final acidity to be. All are sustainably grown and his goal is a slightly lighter, leaner style of wine that retains its fruit flavors without being jammy. The second wine was the 2009 Red Blend (Cabernet Sauvignon, Petite Sirah, Barbera), 13.5% ABV. We reviewed the 2009 red blend when it was being produced with the Tamás label (see http://www.thefrugalwinesnob.com/?p=866). Karl said the intention was for the Barbera to bring fruit to the mix; cassis from the Cabernet; and blueberry from the Petite Sirah. We enjoyed the strawberry aroma and taste as well. Its structure and good acidity made it smooth and somewhat gentle although flavorful; Karl would pair The Grateful Dead with this one. Our evening was topped off by the 2010 Zinfandel, Livermore Valley, 14.5% ABV. Blended with Barbera for blackberry flavors, and Petite Sirah for fleshiness, this was indeed a delicious wine that also paired well with our rich homemade spaghetti-with-meat-sauce dinner the next night. Although aged for more than a year in American, Hungarian, and French oak barrels, Karl still works to accentuate the fruit flavors rather than the oak. Cherries, raspberry, strawberry, vanilla, nice finish. I liked it immediately and even more as it opened up. All the wines have screwcap closures. Karl swears by this method, stating that the wines are much better protected from spoiling and that they can be aged almost much longer than one would expect. We agree; for links to a couple of articles, visit http://www.thefrugalwinesnob.com/?p=552. The ustream.tv experience was less satisfactory than the Pine Ridge tasting several months ago. This time we experienced buffering issues and commercials were presented every 10 minutes or so, necessitating an upgrade to a paid version. Still, this method of presenting wines to the public and to publicists is promising. This entry was posted in Barbera, Cabernet Sauvignon, California, News, Petite Sirah, Pinot Grigio (Pinot Gris), Riesling, Tastings, Viognier, Zinfandel. Bookmark the permalink. 2 Responses to WINE-TASTING: Double Decker brand launch event Monday, April 23. 2010 Pinot Grigio, 2009 Red Blend, 2010 Zinfandel, $9.99 each. We still use this kind of wine at some our tastings, mainly for special events and it is a big hit with a lot of people. What do you think of the length of this like? If by “length” you mean finish, if memory serves the 2010 Zin had the longest finish. They are all serviceable, tasty, and versatile bottles of wine; nothing spectacular about them but good bargains at the price. I haven’t tasted any newer Double Deckers. Cheers!